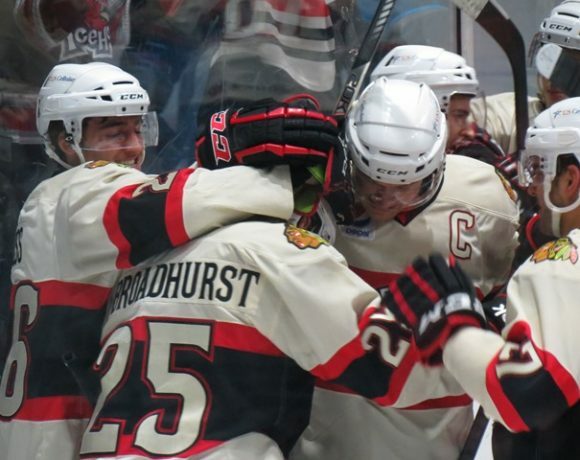 The Rockford IceHogs have six games in the 2018-19 season to wrest a playoff berth from a host of Central Division rivals. Whether the piglets can do so hinges on how this group of youngsters can finish up, starting this coming weekend in Texas. The Stars, along with Milwaukee, put themselves in the catbird seat for the time being with a pair of wins in Iowa this weekend. The Admirals, who’s three-game sweep of Rockford last week propelled them back into playoff consideration, beat division leaders Chicago and Grand Rapids in back-to-back games. The Hogs beat the Griffins 4-1 at the BMO Saturday night. They then dropped a 5-2 decision to the Wolves the following afternoon. A split was a pretty decent effort for Rockford. It just wasn’t enough to keep pace with Texas and Milwaukee. Through 70 games, Rockford (32-28-4-6) are sitting in seventh place in the division standings with 74 points, three points behind the Admirals and Stars and one behind Manitoba. Fourth place is attainable. The road is uphill, but it is very, very clear. Take care of business Tuesday night against last-place San Antonio. Do not leave the BMO with any less than two points. Overtime, shootout…doesn’t matter. Sweep Texas this weekend. Two regulation wins. The Stars must be denied even a single point. Beat the Ads April 9 in Milwaukee, then come to the BMO and beat them again in the final game of the regular season April 14. Regulation wins? Yup. I was going to suggest that dropping the penultimate game on the schedule to Iowa might be all right if the first three steps were met. You know what? Better knock off the Wild as well. Hey, if things had gone differently against Milwaukee last week, it wouldn’t be so dire. However, the Admirals have an eight-game point streak going and Texas has won three in a row. That postseason berth will have to be won. That may well mean running the table the last two weeks. The kids aren’t putting in enough effort. The team doesn’t score because they aren’t shooting enough. Derek King is a terrible coach because he stands behind the bench with his arms crossed. Anton Forsberg is the worst goalie in the history of ever. I lack the time to fully dissect these theories for validity, but respectfully disagree with each of the above takes. Last night, on my twitter page, I belched out a lengthy diatribe on the subject. Below is said diatribe. 1. Reading a lot of fan frustration following the Hogs 5-2 loss to Chicago this evening. Words like “effort” and “coaching” and “Forsberg” trying to point a finger at what is a borderline playoff team. 2. 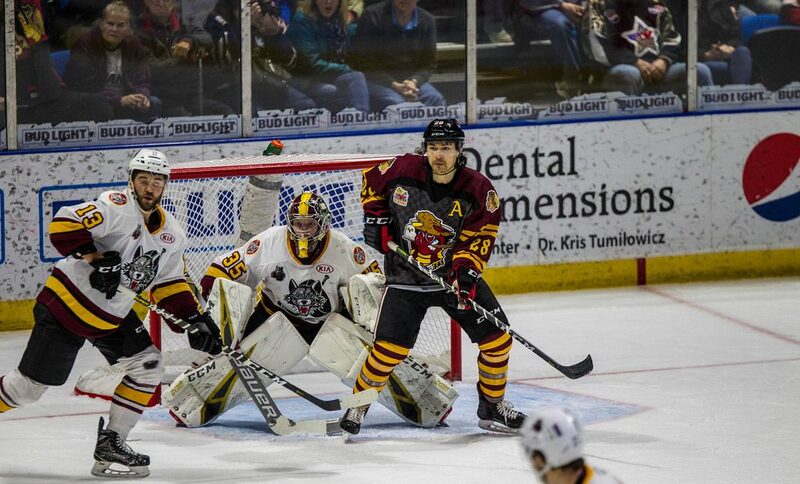 RFD split the weekend and probably needed to get four points after dropping three straight games to MIL last week. Hogs are three points behind the Admirals, who have the fourth Central berth with six games to play in the regular season. 3. It’s not a lack of effort or a desire to hit the links this spring that has RFD in its current position. Interim coach Derek King is not the the anchor keeping the Hogs from another spectacular postseason run. Nor is it any of the three goalies. 5. David Kampf, Lance Bouma, Chris DiDomenico, John Hayden, Cody Franson and Adam Clendening were all added to the IceHogs roster in the spring of 2018, This is the sole reason that the IceHogs reached the postseason and why they went as far as they did. 6. This season, King lost his top goal scorer, Matthew Highmore, to injury. Then leading point-producer Dylan Sikura was called up. Peter Holland was obtained and has been a big part of the RFD offense. However, King received a pittance of the bounty provided for Jeremy Colliton. 7. Not sure King is going to have the “interim” removed from his title following the season. I will say this; no way Colliton gets substantially more out of the current piglets. They don’t score consistently, at evens or on the man advantage. 8. RFD may or may not get to the playoffs. They are kids; young teams are streaky by nature and effort has nothing to do with this. If King manages to coax the IceHogs into the postseason despite the AHL’s worst offense and power play, tip your cap to the guy. In the spirit of honesty, the Hogs scored a power play goal this weekend to move up to 29th in the league with a man advantage. Brandon Hagel and Reece Johnson both made their pro debuts Saturday night. Hagel was assigned to Rockford by the Blackhawks; Johnson signed an ATO with the Hogs. On Sunday, Spencer Watson was recalled to Rockford from the ECHL’s Indy Fuel. Fredrik Olofsson was released from his ATO. San Antonio visits the BMO Harris Bank Center Tuesday night. Then, it’s off to Texas for two pivotal contests.